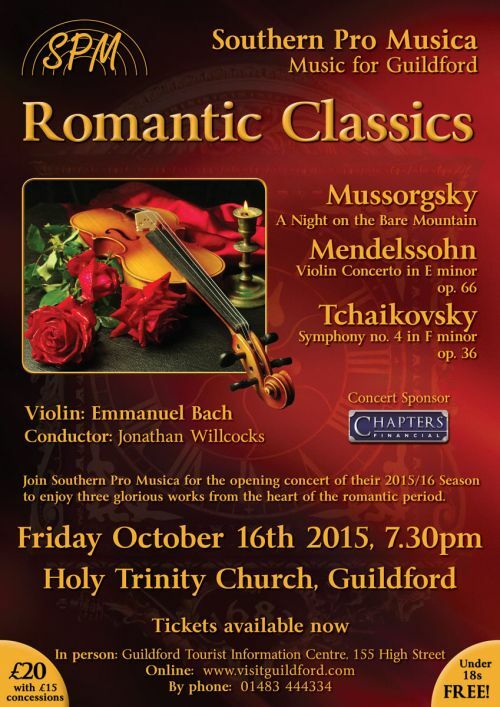 In this opening concert of the 'Music for Guildford' season, savour three major works from the heart of the romantic period. The Russian passion of Mussorgsky's colourful overture and Tchaikovsky's dramatic 4th symphony are complemented by the ever-popular Mendelssohn concerto, played by prize-winning virtuoso violinist Emmanuel Bach. Emmanuel was educated in Guildford, followed by Oxford University, and now studies with the distinguished Russian violinist Natasha Boyarsky. His burgeoning international performing career has included concert appearances in Europe and South Africa.